Markets surged this week, quickly rebounding from last week's sudden melt-down after the UK populace voted to leave the European Union. While US markets fared well, with the Dow and SPX rising more than 3%, bigger gains came in most European shares. Latin America shares also outperformed. The star of the week though was Silver, which soared 11% on the week. 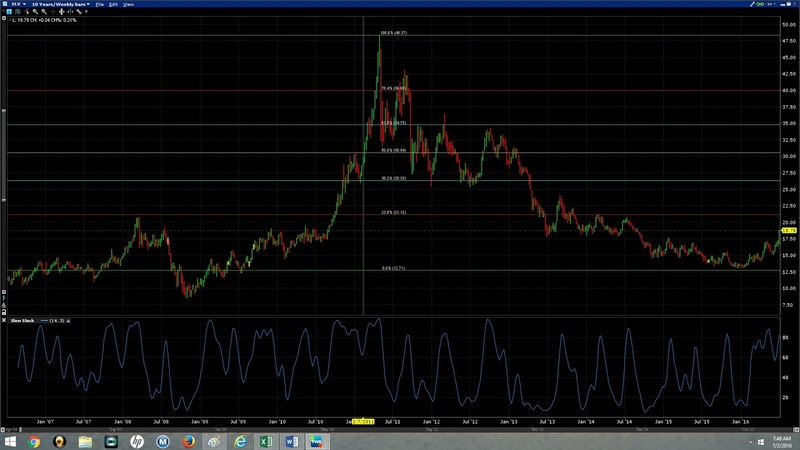 Silver also starred on the monthly returns list, rising 17%. 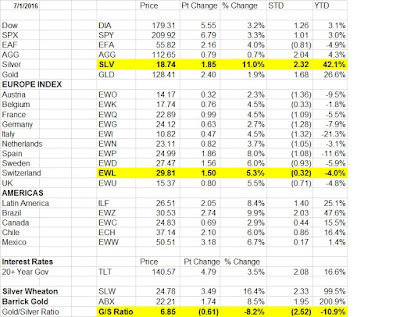 Notice the stellar year-to-date returns for Silver and silver and gold mining shares, Silver Wheaton (up 99.5% on the year) and Barrick Gold (up 200% on the year). Surprise, surprise! 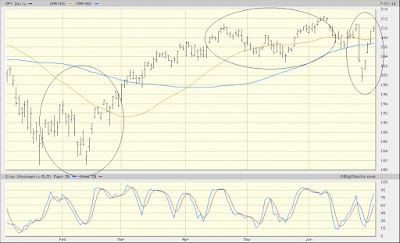 Another V-shaped rebound. Just look at past attempts of the market to sell off. 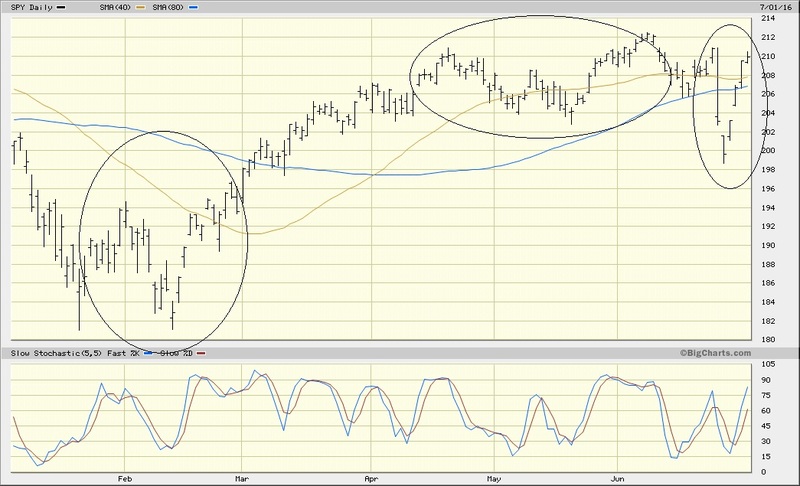 Each time, markets quickly rebounded and climbed back to the highs. It was clearly evident last week when after the Brexit vote, it was immediately announced that the ECB (Euopean Central Bank) would add 250 Billion Euros to shore up the system. I.e., more quantitative easing. Other central banks also added that they were at the ready to print more money. I had recently provided a story about how the hacker group Anonymous had hacked into Federal Reeserve systems and found that the Fed owned more than 50% of many large US corporations. I have seen no additional news regarding this nor had Anonymous, to my knowledge, released the files that showed this. Yet it's not surprising that The US Federal Reserve would be buying stocks to "stabilize" the market. Other central banks have released information showing their US stock holdings so why wouldn't the US be in the lead on this? Even if the US Federal Reserve is not holding large stock positions, other Central Banks are and of course, they are too "SYSTEMATICALLY" important to allow their assets to fall. Well, perhaps this game is over. And the sudden surge in SILVER could be the evidence. The breakout in silver was as unexpected as ever. Many have suggested that the prices of gold and silver have been manipulated in the futures markets where institutions sell futures contracts to artificially suppress prices. This can be easily accomplished in the futures markets since seldom does delivery of the actual physical commodity occur. And, should anyone actually try to corner the market and buy more silver and gold than is available for delivery, the contracts may be settled in cash. As a result, the laws of supply and demand go out the window since supply can be created just like our paper money is created, with a key stroke. There is nothing real that supports it. So where might silver go? 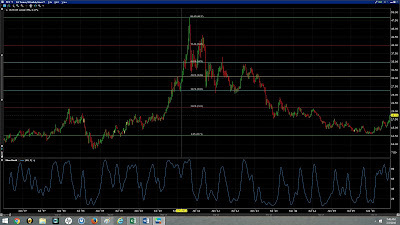 This chart is a weekly chart of paper silver (SLV) if you wish to trade it. We can see the multi-year selloff after a big run-up. Included in this chart are Fibonacci retracement lines. 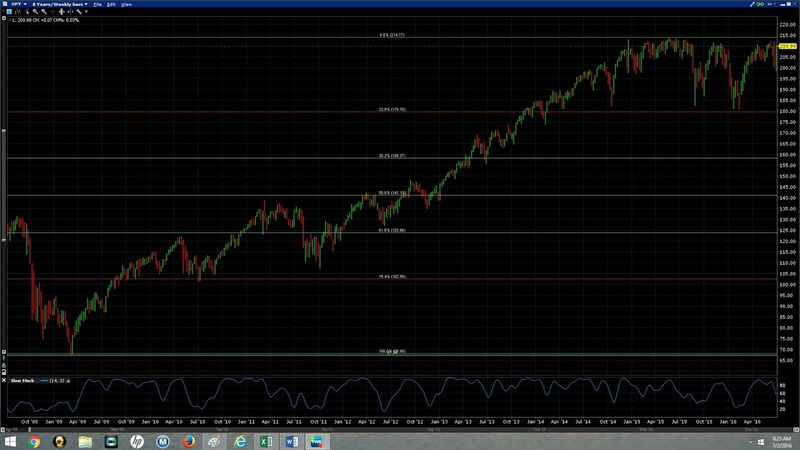 After a move, traders often refer to these Fibonacci retracement levels to project where price might go. 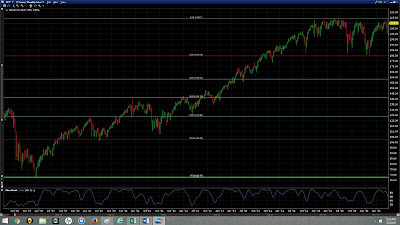 Common retracement levels are 38%, 50% and 62%. There could still be some decent trading profits to be made should these projections play out. Then what? Some believe that prices will then fall back and even hit new lows. They believe that we will be experiencing a long period of deflation, similar to Japan, whose economy has stagnated for 20 years already. Others believe that the massive amounts of money printing that have occurred will cause hyperinflation. Perhaps we are already seeing signs of that in the food we buy. Hey, even prominent fast-food burger joints are using "sawdust" as filler in their burgers. Certainly my 1/2 gallons of ice cream are no longer 1/2 gallons and even my one pound package of hot dogs are now shrinking to 12 ounces, although the price remains the same as the one pound package (in better days). The government cannot show that there is inflation as this would result in higher interest rates, higher social security payments, etc. With the US debt at $19 trillion, interest rate shocks would certainly cause a lot of pain for the government (and taxpayers). The deflation story also used debt levels as a cause. We've all learned early on that when you borrow money to buy something today, you are borrowing from the future. In the future, you will have to pay back the loan. So with governments borrowing so heavily these days, we are consuming today what we would have in the future. Therefore, there will be little growth. Another cause for deflation is demographics. As the populations of many developed countries decline and the birth rates slow, spending cycles will decline. That makes sense. If we build enough houses to suit the baby boomers, when they die off, will there be enough people to sell these houses to? Not if the future generations are smaller than the previous ones. I think that this might be one of the reasons why the government is so pro-immigration, even if it is not done legally. We need more people here to be working and paying taxes to support the social security, medicare and other benefits to the elderly, who are living longer than ever. Whatever happens, I believe that the massive amounts of money printing that have taken place over the years provide reason enough to be an aggressive buyer of precious metals. Looking at the totality of the market move since 2009, we can see that if markets are topping now, the Fibonnaci retracement levels show the potential for pretty good downside moves. Again, we are talking 38%, 50% and 62%. Such moves are unheard of for many people but these are normal market moves. Could it happen? Yes. Will it happen? ??? Someday. While we have made a huge move, a move that has been largely supported by central banks around the globe printing more and more money in an attempt to make their economies more competitive. It is truly a house of cards. But even as I say that and continue to position myself for a major move down, it's possible that the game can continue with higher prices still. This past week, the European Central Bank indicated that it would continue to print even more money and buy securities in the European markets. Japan is all in on this and many suspect that even in the US, the next move by the Federal Reserve will be to lower interest rates and do more quantitative easing. Certainly this will catapult market prices even higher. Where else can the banks go with the money in a world of negative interest rates. 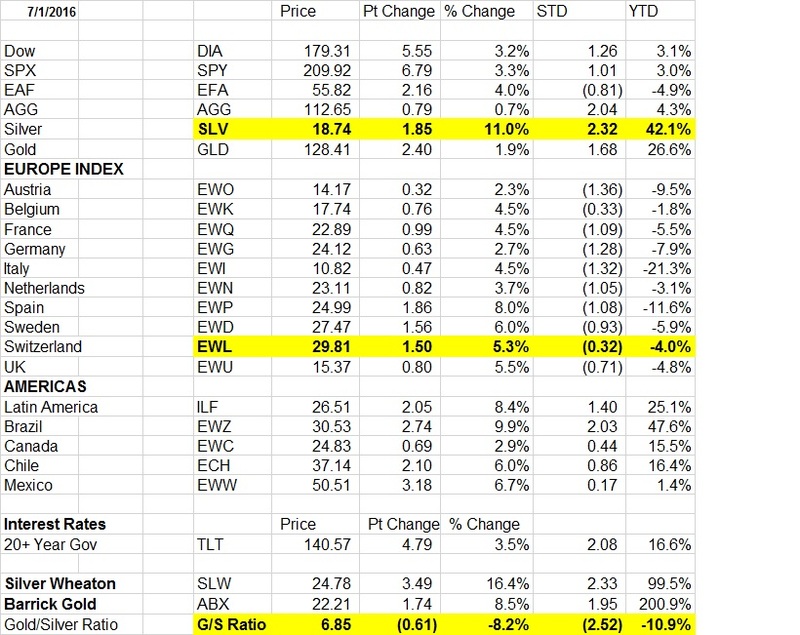 As mentioned last week, I was eying EWL, a Swiss stock fund, at 28. I bought it there and it nicely rebounded along with other European stocks. I also jumped on Royal Dutch Shell (RDS.B) Wanted to get a piece of the oil game. Both did well on the week. Next week, we will get the jobs numbers on Friday. They tend to be meaningless. If they are weak, it will just support the current thought that interest rates will continue to go lower, even negative, in the near future. This will cause stocks, bonds and precious metals to continue rallying. Bad News is Good News. And even if the jobs numbers are good, the feeling is that the Federal Reserve will use the turmoil in Europe as a reason not to raise interest rates this year. So might as well play the game for as long as it lasts.